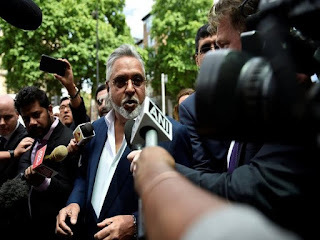 New Delhi [India] : A special Prevention of Money Laundering Act (PMLA) court on Wednesday issued a Non - Bailable Warrant against absconding liquor baron Vijay Mallya, as it took cognizance of the complaint filed by the Enforcement Directorate (ED). ED had filed the first charge sheet against the liquor baron and others in the IDBI-KFA bank loan money laundering case. Earlier, in March 2016, ED had a filed a complaint under the PMLA. Earlier, a London court had granted Mallya bail and after coming out of the court, an embattled Mallya said "You can keep dreaming about the billion pounds, but there's no proof."